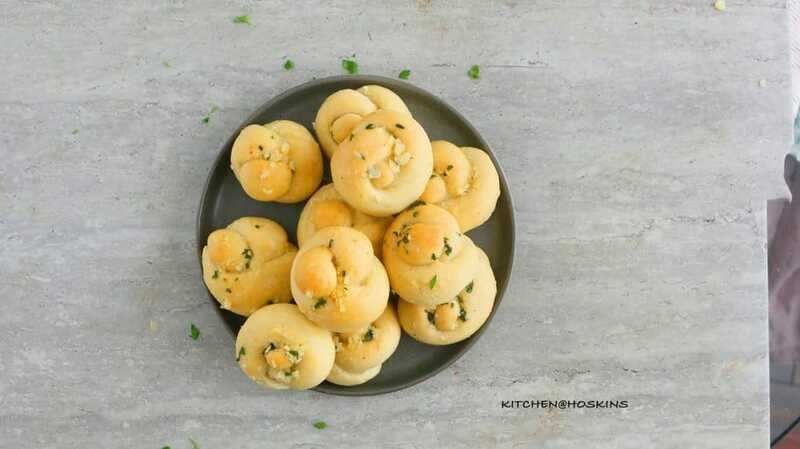 Super soft, buttery, made from scratch garlic knots are surprisingly easy to make with your stand mixer! 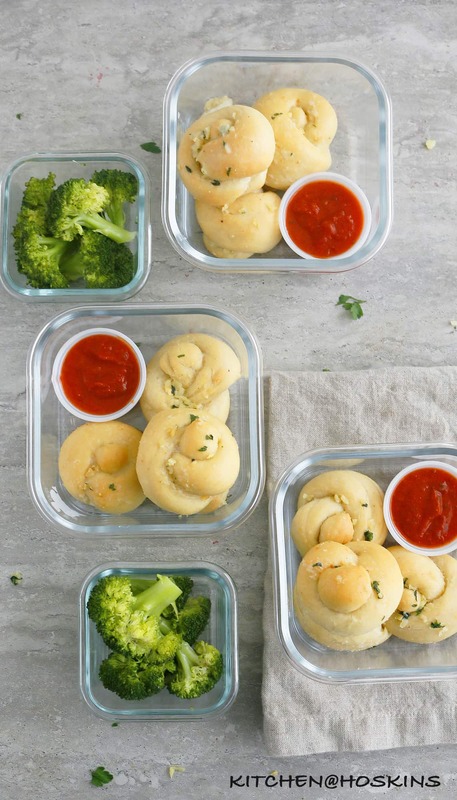 Enjoy these soft garlic knots with homemade pizza dough and some marinara on the side for dipping. They are great as an appetizer for all your get togethers, game day, spaghetti dinner or even packed into school lunch box. This Friday is dedicated to a basic yet comforting. rustic yet addictive, involved yet simple GARLIC KNOT!!! 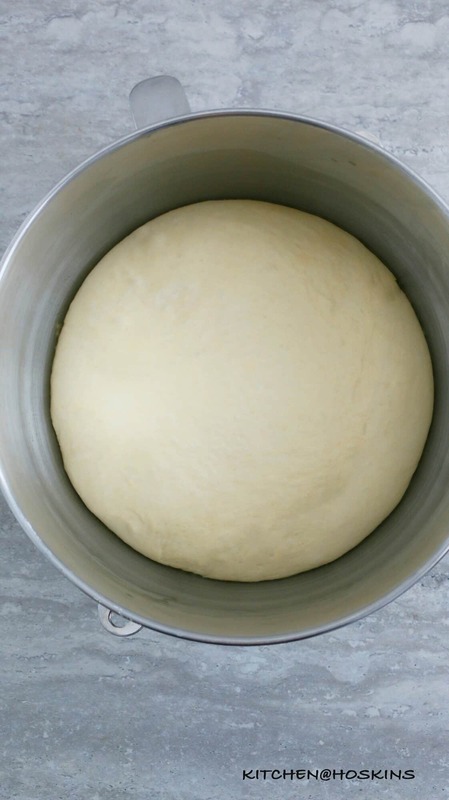 If you have a stand mixer, then this pizza dough is easy peasy! 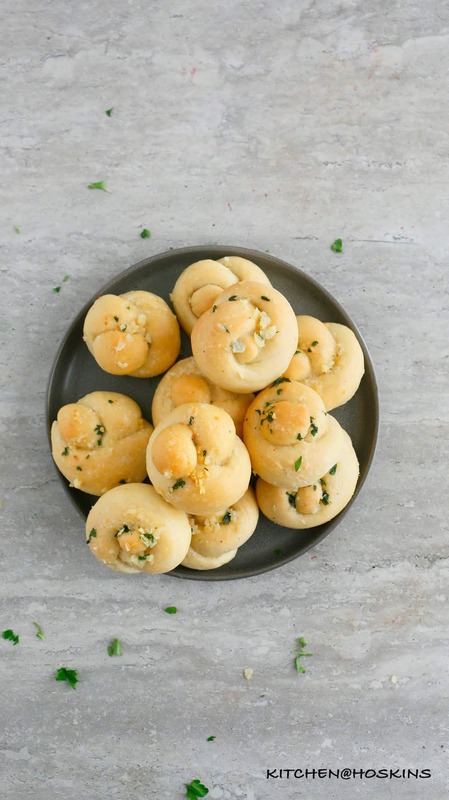 How to make soft garlic knots with homemade pizza dough? Step-1: Dump dough onto the kitchen counter. 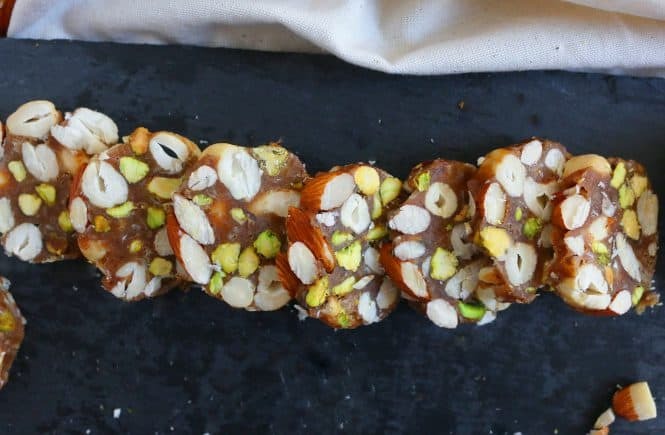 Using a sharp knife, cut dough into 24 equal pieces. Step-2: Shape each piece into a 6 to 7 inch rope, and take the ends of the dough and tie into a knot (over, under and through). Refer picture above. 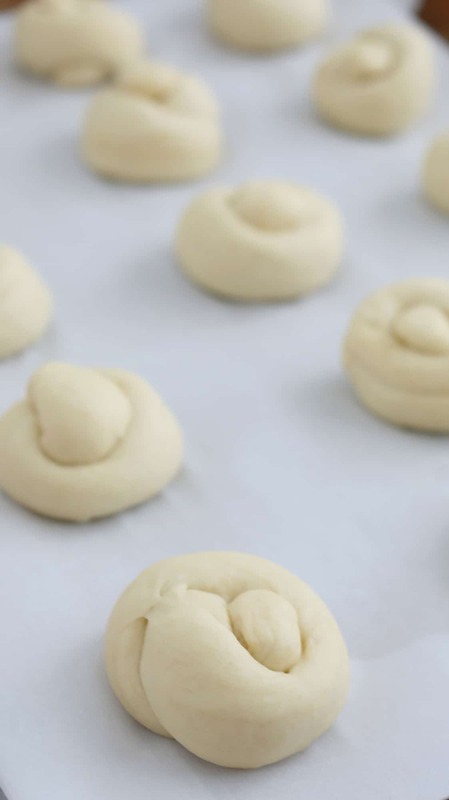 Step-3: Place knots on parchment lined baking sheet, spacing about 2 inches apart. Step-5: While the knots are rising, make garlic butter – Add chopped garlic and butter into a small skillet, cook over low heat (stirring occasionally), until butter has melted completely and the raw edge of garlic goes away (don’t let the garlic get golden). 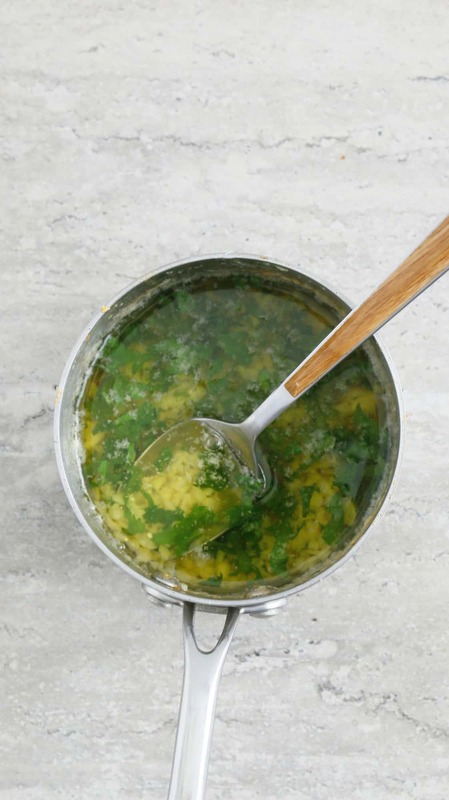 Remove butter from heat and stir in chopped parsley and salt (refer picture below). Step-6: After 30 minutes, brush garlic butter (try to get only the butter without any garlic, since the garlic might burn during the baking process) on top of the knots. Step-7: Bake at 400 degree F oven for about 20 minutes, until pale golden. Remove from oven and immediately brush with the remaining garlic butter, trying to get all the yummy garlicky goodness settled in the bottom of the pan. Enjoy hot!! You won’t be able to stop with one. Color, color, color – PALE GOLDEN and not any darker. Letting the garlic knot brown will form a crusty outside (delicious tho) but not the light texture we are aiming for. 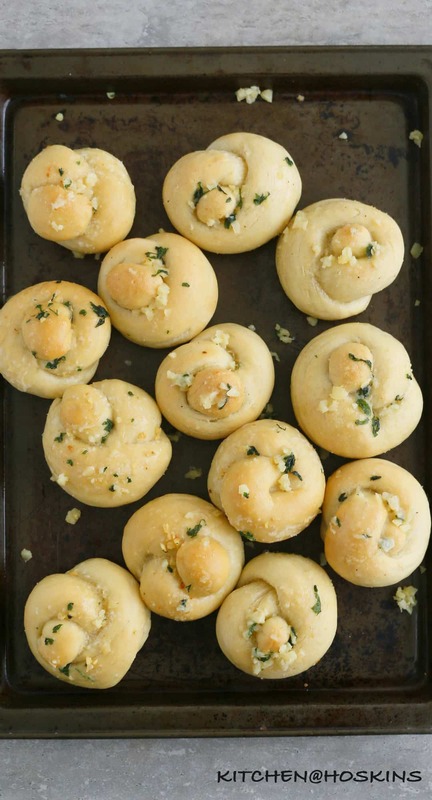 Butter before, butter after – The garlic knots get a double bath with butter. Once before they go into the hot oven and again right after they come out. This two step process not only adds flavor but also contributes to a very light, tender crust. 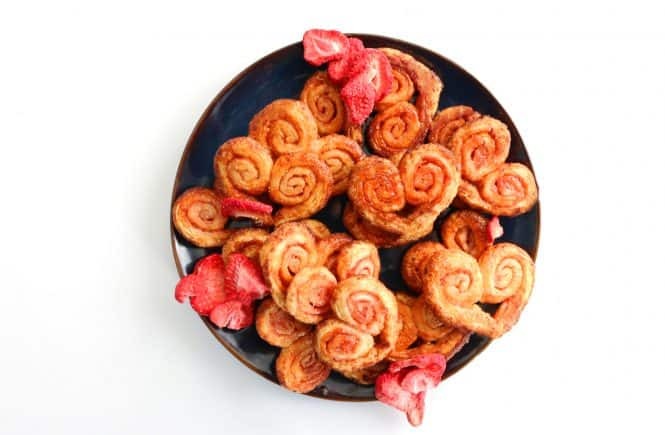 Freeze leftovers – place leftover garlic knots in a zip lock bag and freeze for up to 2 months. Remove as many as needed, thaw to room temperature and microwave until hot before eating. Gluten Free Nutella Brownie Muffins – Moist, fudgy, oh-so-decandent, 4-ingredient Gluten free Nutella Brownie Muffins !!! The simplest of recipes and is an absolute family favorite. Homemade Parmesan Cheese Crackers – These homemade parmesan cheese crackers are crisp, nutty, buttery and is a great snack for both kids and adults. 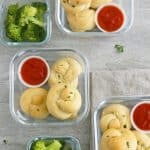 No knead Avocado Dinner Rolls – Soft, fluffy no knead dinner rolls with the addition of avocado and these are so much healthier than the traditional rolls. No stand mixer. No kneading. No eggs. Half tablespoon butter (just for finishing)!! Caprese with Garlic Toast Lunch Box – Light, simple, quick and healthy lunch for work or school! Caprese with garlic toast lunch box is a great way to enjoy in season/late summer tomatoes and basil! 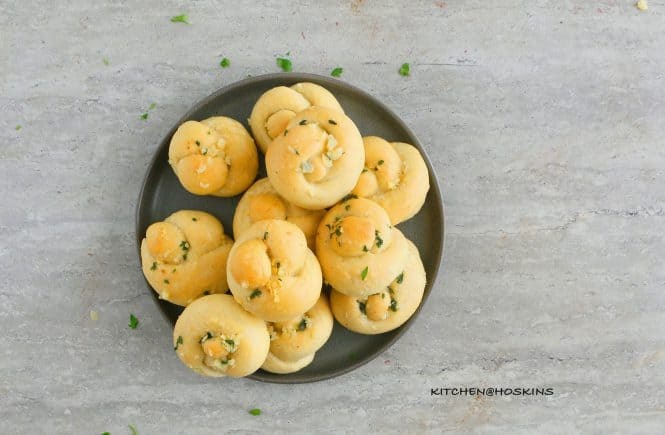 Super soft, buttery, made from scratch garlic knots are surprisingly easy to make with your stand mixer! 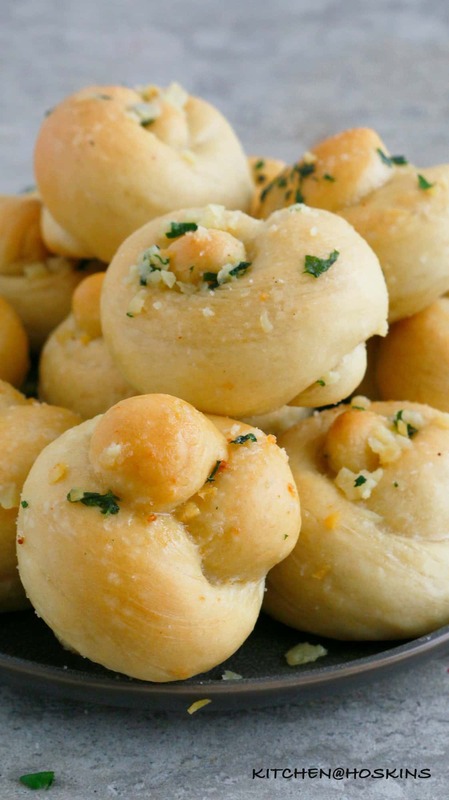 Enjoy these soft garlic knots with homemade pizza dough hot with some marinara on the side. Line two standard baking sheets with parchment paper and set aside. Make pizza dough as per instructions. Transfer dough onto a work surface, cut into 24 equal pieces. 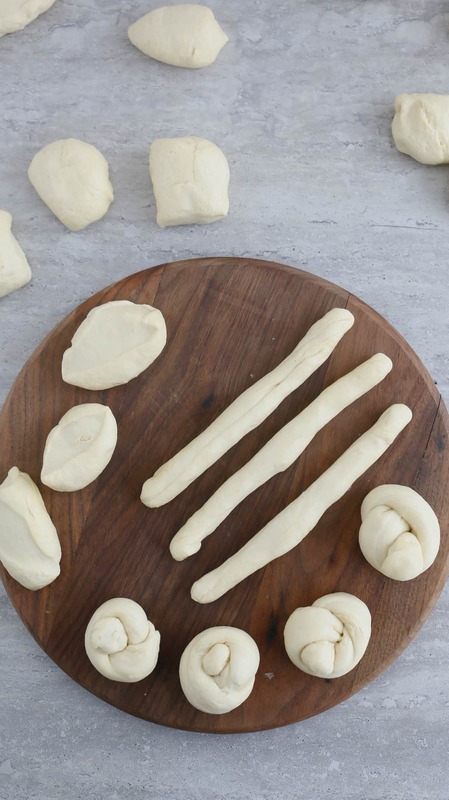 Shape each into a knot – using both your hands, roll dough into a 6-7 inch rope, loosely tie like a knot, tuck edges underneath and place on the prepared baking sheets. 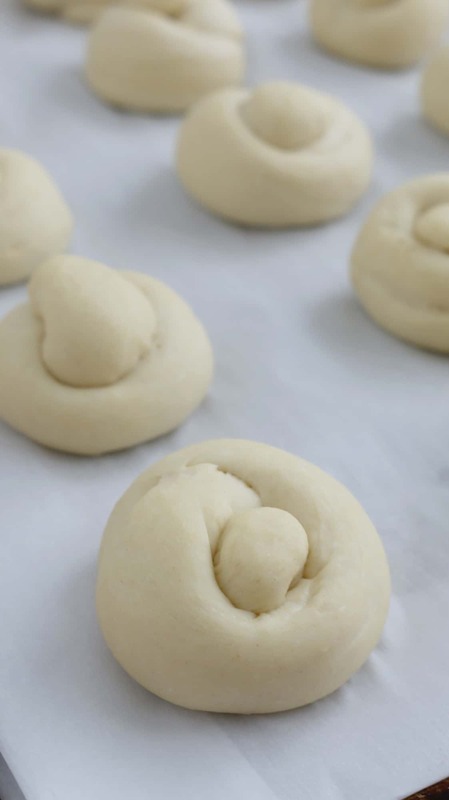 Repeat with all remaining dough and place knots 1-2 inches apart. Loosely cover pan with a clean kitchen towel and let rise for 30-45 minutes, until puffy. In the mean time make garlic butter and then towards the end of 30 minutes, pre heat oven to 400 degrees F or 205 degrees C.
After 30 - 45 minutes (knots would have puffed up by now), working with one sheet pan at a time (keep the other pan covered), brush garlic butter ( try to use only the butter from the top and not garlic) on top of each knot (you will have about half the butter left over which we will use later). Place pan in the middle rack of the oven and bake for about 20 minutes or until golden. Brush with remanning garlic butter as soon as it comes out of the oven (use all the garlic, salt, parsley goodness). Repeat process with the other baking pan. Enjoy hot plain or with marinara sauce on the side. Add butter and finely chopped garlic into a small sauce pan and place over low heat. Cook (stirring occasionally), until butter is melted. Continue to cook, to soften garlic and take the bite off. Remove from heat before garlic begins to get golden (DON'T LET IT GET BROWN). Stir in chopped parsley and salt. 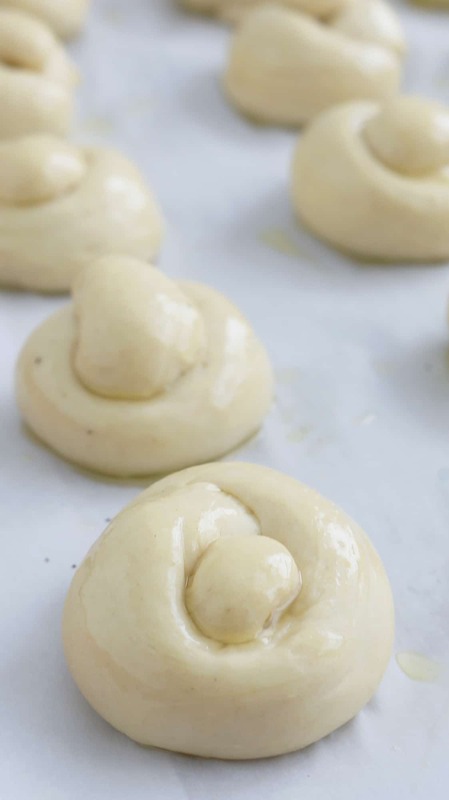 The garlic will settle down and make it easier for you to brush only the melted butter on top of knots before baking. 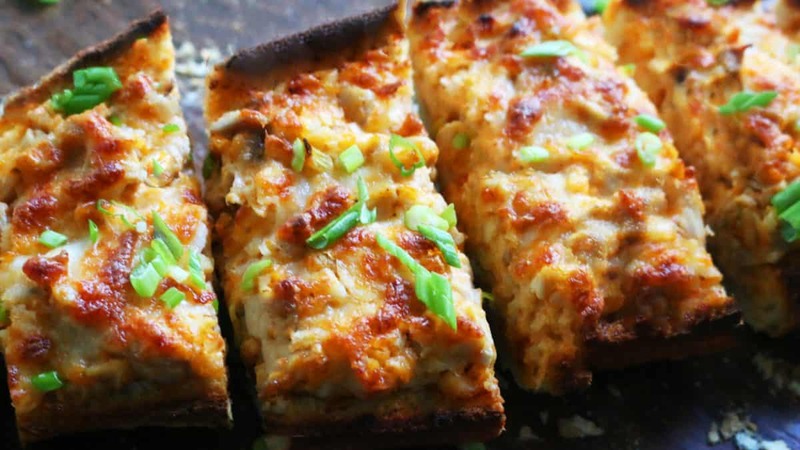 Love that this is made with homemade pizza dough. Sounds so easy. Perfect idea for school lunches! !